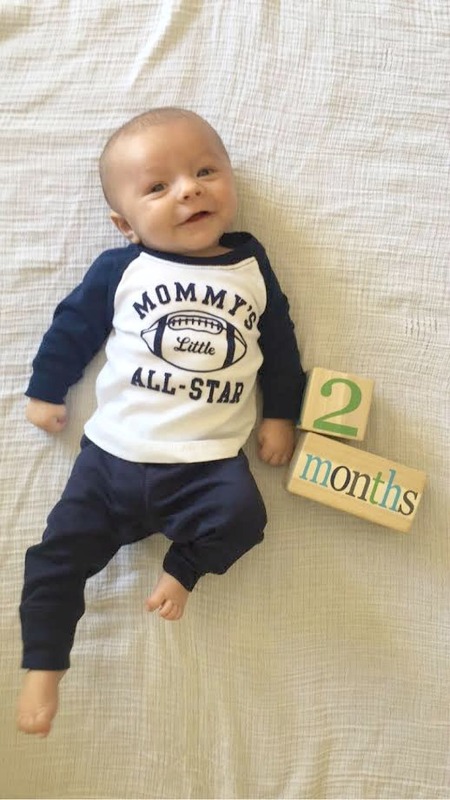 It's hard to believe it's been 2 months since this little guy was born. I couldn't complain about Grayson if I really tried. He is honestly a dream baby, and is much easier than Camden was at this age. He is so calm and relaxed most of the time. One of my favorite things at this age is watching him stretch after he wakes up...his adorable facial expressions/yawns and his little arms over his head. It's something I miss so much as they get older. He's just so snuggly right now! I love that he goes to bed later than Camden because it gives me more time to just love on him and only him. Sometimes I feel guilty about him not getting as much as attention as Camden did when he was a baby. Speaking of big brother, this past month we've seen his love and interest for Grayson really grow. Cam is constantly coming over to lay by him, rubbing his head, giving him hugs, and is always asking where he is. We can tell how much he loves him and it's the sweetest thing ever. I feel so blessed to raise brothers! Diapers: Using up the last of our 1's box then he will be in 2's! Sleeping: Bedtime is normally around 8 and he sleeps until 4/430. Goes right back to bed after that until 7ish! We are currently trying to transition him out of the swaddle by doing one arm out and then hopefully in a few days to both arms out. He normally has one good long nap in the afternoon, and the other ones he tends to catnap for about 45 minutes for those. Dislikes: The normal culprits - gas and wanting to eat! 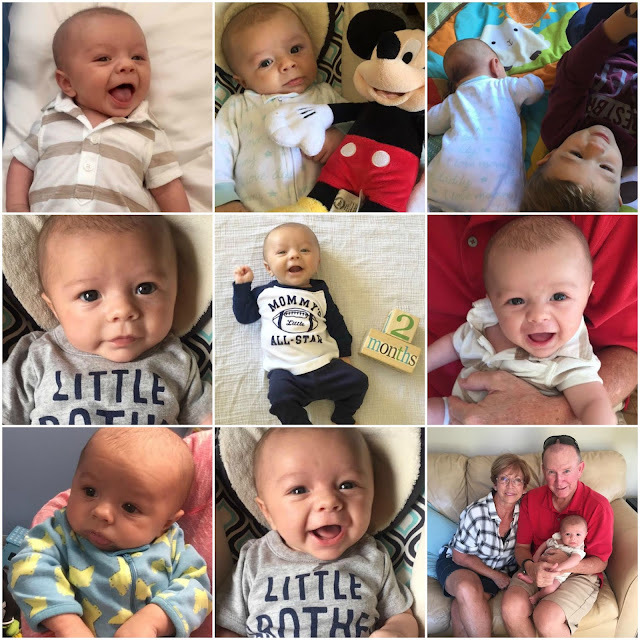 Milestones: He is cooing all the time now - we love hearing the start of his little voice! He does great holding his head up during tummy time. I think he will like sleeping on his stomach like Camden once he gets a little older! He loves when we talk to him and he will look for me in the room when he hears me. Melts my damn heart. When he's awake, he's most likely smiling or looking around for his brother. Also, everyone thinks him and Cam look like twins nowadays. While they do look so much alike, Grayson is SO much chunkier. Cam never had chubby cheeks or rolls and Grayson's got that covered! We love him so, so much and I want him to stay this little forever.